Why have an online video strategy? 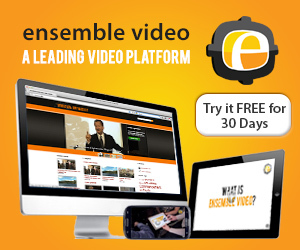 Ensemble Video is a turnkey video platform that streamlines video capture, video management and video publishing. Ensemble Video enables hundreds of progressive organizations across the globe to deliver accessible media content any time, over a variety of networks. Discover the incredible value and power of our streamlined video capture, video management and video publishing platform!